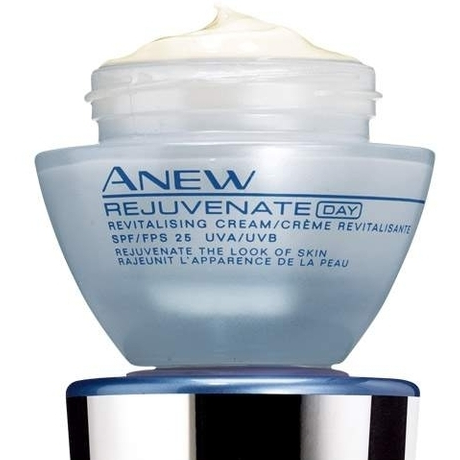 Avon Anew Rejuvenate Day Revitalizing Cream SPF 25 UVA/UVB addresses early signs of aging. A lightweight day cream uniquely engineered with a breakthrough fusion of pioneering technologies designed to replicate the steps of a professional anti-aging facial. * Exfo-Smoothing Complex - designed to exfoliate, smooth lines and clarify to help reveal fresher, younger looking skin. * MiniExtraction Technology - formulated to work like thousands of micro-extractions to help deep-clean impurities and tighten pores. * Revitafresh Technology - engineered to reinforce cell bonds and help skin look more even and smoother. - IN 2 WEEKS - 79% of women saw younger-looking skin with smoother skin texture and refined pores. - OVERTIME - 50% improvement in texture, clarity and tone with reduced fine lines and more even skin tone. Octinoxate (7.5%), Octisalate (5%), Avobenzone (3%), Oxybenzone (3%), Other: Water, Dimethicone, Isodecyl Isononanoate, Glycerin, Butylene Glycol, HDI/Trimethylol Hexyllactone Crosspolymer, Hydroxyethyl Acrylate/Sodium Acryloyldimethyl Taurate Copolymer, Dilauryl Thiodipropionate, Polymethyl Methacrylate, Thiodipropionic Acid, Salicylic Acid, Eclipta Prostrata Extract, Gossypium Herbaceum (Cotton) Extract, Palmitoyl Tetrapeptide-7, Sodium Hyaluronate, Phyllanthus Emblica Fruit Extract, Foeniculum Vulgare (Fennel) Seed Extract, Yeast Extract, Saccharomyces Lysate Extract, Kaempferia Galanga Root Extract, Saccharomyces Ferment Filtrate, Dimethicone Crosspolymer, Sorbitan Isostearate, Silica, Steareth-20, Lactoferrin, Phospholipids, Isohexadecane, Hydrogenated Lecithin, Phenoxyethanol, Acrylates/C10-30 Alkyl Acrylate Crosspolymer, Carbomer, Tromethamine, Polysorbate 60, Methylparaben, Disodium EDTA, Propylparaben, Fragrance, Mica, Titanium Dioxide. This is a very good cream. Good value for money and does the job it promises. I used this cream for a while,it is a lovely consistancy which is also non greasy. 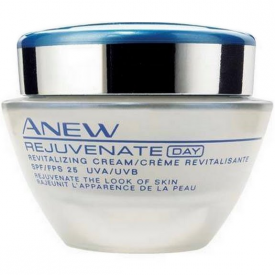 Anew rejuvenate is for any one 30+, As I just turned 30 thought I would try it out. I really liked this day cream as it gave my skin a much needed moisture boost would recommend this for any one 30+ its great.